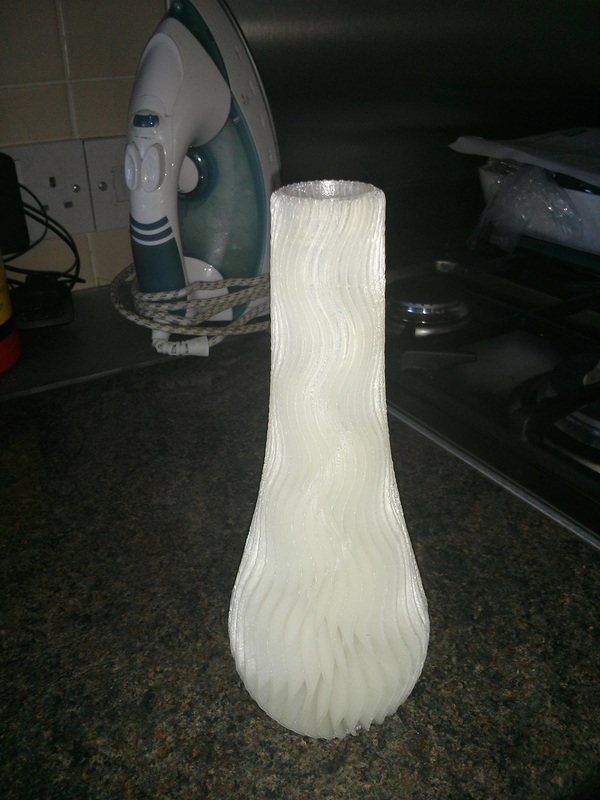 I received my cherry pi lll a few weeks ago and still playing with settings.Im impressed with its speed and quality.Andy has been very helpful with settings etc.Here are a few things I have printed,I still need to fine tune it. 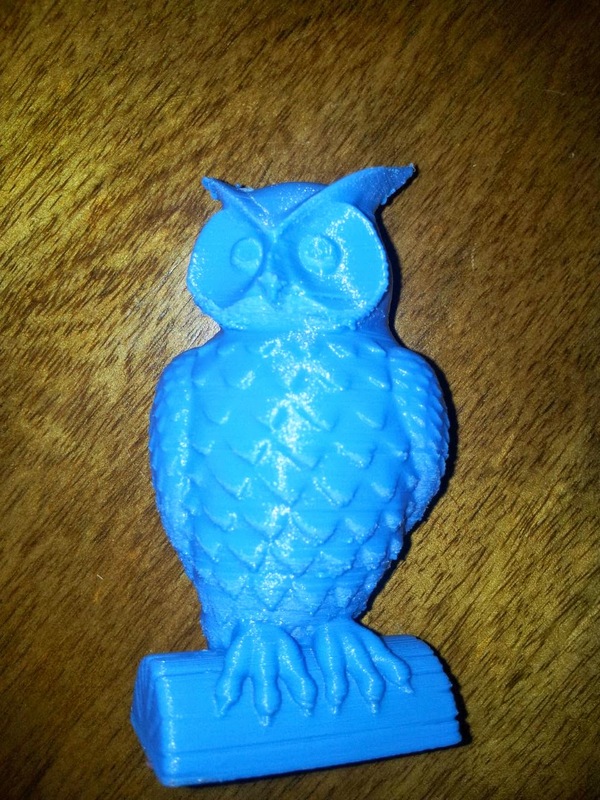 I think the owl was at 0.2 and vase at 0.3 layer height. very nice! it's a good printer! Andy (or someone else), I'll have to reprint the wheels carriage to match my spring loaded carriage. I have MISUMI extrusion, what version should I use? "For completeness of the discussion, Misumi 2020 has totally square-cut slots. The Mini-V wheels *barely* have any contact with the inside of the slot, and require a larger mounting plate (or a shim to pry the Bosch/Rexroth sized carriage open wider). Although they have not de-railed *yet* on my printer, I would say that the use of Misumi 2020 with the Mini-V wheels should be strongly discouraged." Oh... this is sad... even more when I think that I got ripped of with shipping they don't tell you until they ship! Could you add a 45 degree chamfer on the slots with a square file? Edited 1 time(s). Last edit at 10/13/2014 03:36AM by AndyCart. what is the size of springs you are using? I tried this on my 3dr ( made new carriages and micro platform ) .The problem i face is that if i hit the rods by mistake while adjusting something on the printer the rods pop out of the socket and then everything goes flying here and there. Is this normal or are my springs not strong enough? Edited 1 time(s). Last edit at 10/20/2014 02:31AM by AndyCart. can you please add a little more detail like spring diameter and spring wire diameter? will help me give a idea of what a STRONG spring is..
thanks a lot. the spring i am using are 7mm with 0.8 mm wire which is 60mm long. I will get a set of stronger springs and try again. You need to remove the arm, pull the cord a little and then "push" the arm into place... the spring will now be loaded with good amount of force. Mine is nearly together! Just need to install the extrusion module and wire the associated connections. Unfortunately my clumsiness cost me one of my microswitches so that won't happen for a couple of days. Everything else is looking good with only a few hiccups. I still need to find a build plate (I tried cutting glass for the first time... fun but I still need to find a build plate haha). How did you guys determine how much tension was appropriate for the drive belts? I think mine have a nice amount but it's hard to describe... They don't have much slack at all, but they're not so tight as that they might cause the tower caps to creep down over time. I think the only way I'm really deviating from the original design is that I'm not going to pass the wiring for the extruder/feeder through the extrusion; I'm just going to run it under. Is there any issue with that or was there a specific reason (other than aesthetics) that they pass through the extrusion in the original design? While I'm here, is there anything I should keep in mind for wiring? From the perspective of looking toward the LCD screen, I've assigned the tower on the left as X, the tower on the right as Y, and the tower at the back (with the extruder stepper) as Z. I think my main concerns are a) have I assigned the right positions for the microswitches (are they connected to the min or max pins? ), and b) if I've wired my steppers correctly (everything I've seen seems to indicate that the wires are in the same order leaving the steppers as they are entering the board... for example, looking at the stepper motor connector on the motor, it might go green, red, grey, yellow, and on the RAMPS board they enter the receptacle in that order too). EDIT: I've tried creating a new set of arms too and these seem much more equal length, so I'll give them a shot. Carbon still seemed to be the way to go for economy reasons. Edited 1 time(s). Last edit at 10/25/2014 08:22PM by pugzor. For a build plate search on Ebay/Amazon for mirror plates for candles they are usually 6mm thick and seemed to be toughened glass. In the UK a 250mm diameter one is about £5. There's no design reason to take the wires through the extrusion, purely aesthetic. The stepper wiring doesn't matter as long as you get the correct pairs. If all the cables from the motor are disconnected it should be easy to spin the shaft by hand. Connect two wires together, spin the shaft again, if it's just as easy to turn those wires aren't a pair. If it's suddenly much harder to turn, and feels 'notchy' then you have a pair. The connectors on RAMPS are designated 2B 2A 1A 1B the numbers designate the pair so connect one of your motor pairs to the 2's and one to the 1's. It doesn't matter, at this stage which is which but make sure all your motors connect the same way (you have half a chance of getting it correct) if a motor spins the wrong way (carriage goes up instead of down, etc) then just pull the plug off RAMPS for that motor (after disconnecting the power!) and turn it through 180 degrees. It will now spin the correct way, or you could invert the motor in Marlin. Edited 1 time(s). Last edit at 10/26/2014 02:21AM by AndyCart. Awesome, thanks for that Andy! Actually just dug up a build plate then (4mm thick mirror, 250mm round, beveled edges) which I hope will be fine. If required I might get something else to adhere to the bottom of it to strengthen it a bit... here's hoping the 4mm is fine though. I'd looked on eBay previously without luck. Might have been looking for glass and not mirror.. who knows. Thanks for the tips on RAMPS too. There's so much info out there on it but I've struggled finding stuff specific to deltas. I mean, I could always make educated guesses, but it's a lot less stuffing around if I just ask on here. Good news is that I didn't actually break my microswitch haha! I thought I'd broken the lever but ends up they actually are just held in there and can be removed with a slight bit of force, but also inserted again without difficulty. Even though we're playing with home made deltas I still get impressed by the precision of small components like that. Build plate will be here in 2 days and hopefully the filament isn't far off! Maybe a calibration video might be required haha. Oh, the only other question I have is... after looking through some of the config files for Marlin, will I need to measure precisely the full length of the delta rods? I think I recall seeing a measurement of 238.4mm or similar, but I only have a tiny 200mm set of digital verniers. Is there anything else a bit tricky that I will need to do for the config? For the length of the delta rods just do the best you can with a good ruler. You will invariably need to tweak the value when you commission anyway. It's the delta rod length that governs the size of your printed parts in the X & Y dimensions. It's very rarely what the rods actually are! I've just seen your post. Great job. They do work really well don't they? thanks for the great joint system ( it can be applied in a lot more other places also ) .. So, it appears I've got my CP3 assembled. But there's a problem... I'm finding it difficult to figure out WTF to do with software to drive it, haha. Edited 1 time(s). Last edit at 11/01/2014 12:59AM by pugzor. You need to connect to a host program to send gcode commands to the machine. I use Repetier Host in 'expert' mode but I know lots of people use Pronterface. They are both free. Just Google them. In terms of what to adjust, if you run an M666 L it will list the available things you can tweak directly from the host and then save back to EEPROM with M500. The part cooling fan connects to D9 on RAMPS. If you have a separate hot-end cooling fan alla E3D V6 then wire it direct to your 12V supply. The second power in connector is for a heated bed psu. Wicked. Glad I checked with the board before I powered it up. Connected it up to D9. Unfortunately it seems I'm having comms problems though. I've been playing with com ports and baud rates but nothing seems to be sticking. I can flash the firmware fine but giving it commands isn't doing anything. It just says "x Command Waiting" where x can be any number of commands I try to give it. Anyway, while I'm trying to figure it out, here's a couple more pics of my handy work. Could have done a better job but I'm expecting to have to deconstruct it to repair %@#^ ups. make sure Arduino IDE is closed when you connect to the printer with the 3D Printer Software, as there can only be one connexion to the serial port at the same time. Make sure you are connected at the right baud rate (defined in the conf.h) or try to lower it to 19200. Anyone care to post up a relatively standard version of their CPIII config.h? I might try to start from scratch... something's not right. Are you using a Mac or.a PC? Win 8.1 on an Asus laptop. I've made sure it's on COM1 with a baud rate of 115200 (since that's what the config file seems to point to), and have confirmed that these settings are consistent in Arduino IDE and Repetier. I've been playing with it for about 3 hours now, so I'm pretty much ready to sell it already haha. Edited 2 time(s). Last edit at 11/02/2014 03:15AM by AndyCart. That's a bit concerning then, because I've been able to update the firmware through Arduino IDE several times without issue. Originally windows allocated COM3 but I saw references to 'serial port 1' in the code, so I force changed it to COM1 since it wasn't in use. I might try changing it to COM5 or something when I get home and try that.